Here are some extremely potent psoriasis and eczema treatments and home remedies that are guaranteed to get rid of these shocking skin conditions fast and for good! Both psoriasis and eczema are auto-immune disorders, which basically means the body’s immune system mistakes its own cells as a pathogen (foreign invader) and then attacks those cells. Our body's skin normally takes about 30 days to shed and be replaced by new skin. (This cycle is ongoing and never stops). The problem for psoriasis suffers is this shedding cycle only takes about 4 days instead of 30, so you get a quick build-up of dead skin cells on the surface of the skin. The only positive is this fast-paced skin cell proliferation usually only occurs in patches over the body, so you don't end up with a complete covering. The worst affected areas are normally the scalp, knees, elbows, knuckles and lower back. It's no secret that psoriasis is one extremely uncomfortable, and even somewhat embarrassing condition, mainly because of how it looks and the incredible itchiness it causes. In fact, it is not uncommon for sufferers to scratch their skin until it bleeds! Of course, psoriasis and eczema also make you very self-conscious, which is understandable. Most psoriasis sufferers completely cover themselves up, even during the summer months - and many severe sufferers are even reluctant to leave their own homes and go out. It really can be a living nightmare for many people, and if this is you then I have to say... you've definitely come to the right place for help! What are Your Medical Options for Treating Psoriasis and Eczema? The standard medical treatments for psoriasis and eczema include powerful steroid creams and cortisone injections. Both of these come with terrible side effects and actually do very little to improve the problem. If you’re really game you could always try taking Merk’s new pharmaceutical “wonder drug” for psoriasis called Raptiva. However, the European Medicines Agency (EMEA) recently pulled it from the market after 3 patients suffered severe brain infections (two of them died) so we certainly wouldn’t recommend you try that one! Let's Cut to the Chase About What are the Best Psoriasis Treatments? If you do suffer from psoriasis or eczema then you'll probably already know what the symptoms are and very likely have a good idea of what orthodox medical treatments are available, so we won’t bother to go into these any more. What we will do instead is get straight into giving you some powerful natural remedies for psoriasis and eczema that really work! There are several different forms of psoriasis, but the treatments for each of them are basically the same. The secret to curing psoriasis and/or eczema for good is to take a holistic approach, which means a combination of internal and external remedies. Searching books and the internet, I’m really amazed at the distinct lack of good and usable information that’s available on psoriasis treatments and home remedies. Especially, as you're about to discover, this condition is actually quite easy to reverse and heal! The simple reality is we now have a very powerful and silent killer happening right around the world today. It’s called the nutritional deficiency dilemma! Our food crops are almost totally void of the very nutrients that give and sustain life for all of us. Combine this with the sharp rise in genetically modified foods (GMO’s) now being produced, and the results are truly catastrophic for our overall health and well being. The sad truth is we can no longer rely on any of our foods to give us what we need. You see, our bodies need 90 nutrients every day to cleanse, repair and regenerate themselves (including our skin). Without these nutrients we slowly wither and die the same as any plant that doesn't receive water or fertilizer does. And one of the rarely talked about causes of auto-immune diseases (including psoriasis) is actually nutritional deficiencies. We would also like to add that you can heal every sickness, every disease and every ailment with mineral supplementation. And this definitely includes all autoimmune diseases! The bulk of the 90 nutrients our bodies need everyday are minerals (we need at least 60) and the fact is the only way you can make sure you receive all of these minerals is to consciously put them in your mouth every day. And one of the most efficient ways to do this is by taking a good liquid colloidal mineral supplement. These stunning supplements give you a highly assimilated supply (99% absorbability) of all the essential macro and trace minerals. In addition to this, go out and buy yourself some Himalayan pink rock salt (crystal salt) and use this to salt your food to taste. Himalayan pink rock salt is likewise rich in absorbable minerals and essential trace elements (contains over 84). In my view, taking a mineral supplement on a daily basis and salting your food to taste with pink crystal salt are not only two of the best treatments for psoriasis and eczema, they're also very cheap insurance policies for your body! In addition to minerals, we also need 16 natural vitamins (not synthetic, man-made versions) and 12 free form amino acids. 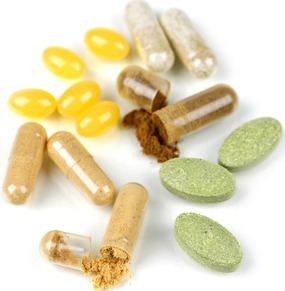 Excellent sources for these include cereal grasses, chlorella and spirulina supplements. And as an added bonus, these “wonder foods” are also incredibly rich in chlorophyll, essential fatty acids and contain some of the strongest antioxidants on the planet! New studies have also been able to confirm that the main nutrients found to be lacking for most psoriasis sufferers (and therefore the main culprits) are zinc, chromium, selenium, glutathione, vitamin A, vitamin E and vitamin D. Thankfully, these green foods supply all of these essential nutrients in a ready-made and highly absorbable form. Natural cures for psoriasis - Why your digestion actually controls whether you get psoriasis or not? Psoriasis remedies - Research confirms the sun is your most powerful weapon in the fight against psoriasis! Psoriasis treatments - Powerhouse foods you must eat - shocking foods you must avoid! Psoriasis home remedy - Why pawpaw and aloe vera could be the best psoriasis cures yet discovered! Remember... to Treat and Cure Your Psoriasis and/or Eczema for Good, Consistency and Self Discipline are the Key! So there are our top 9 psoriasis treatments and home remedies (if you haven't read through each one yet please do). Make no mistake though, following these recommendations every day is certainly not easy... not by a long shot. At some point you may become slack - so be ready for it. However, the rewards of sticking with this program are massive. You will find yourself with a renewed sense of energy and having a totally new lease on life. And with your psoriasis and eczema gone, you'll have no problem exposing your body (with discretion of course) and being able to finally wear the clothes you want to wear instead of wearing the clothes that best cover up your body! Sources and references for this article and all natural remedies for psoriasis articles on this website include: all4naturalhealth.com, howstuffworks.com, naturalnews.com, Sawyer, Troy, How to Increase Your Energy, Cure Poor Health and Enjoy Living Longer, Bragg, Paul C., Patricia, Apple Cider Vinegar.